I realized that it has been a while since I shared a new muffin recipe with you, so how about I fix that? One day last month I decided to make some muffins and went scrounging around in the kitchen for ingredients. I was in the mood for a fruity-type muffin, but as it was nearing grocery-shopping day, I didn't have much fresh fruit in the house. Then I remembered that I did have a pretty good-sized mango still on the counter. 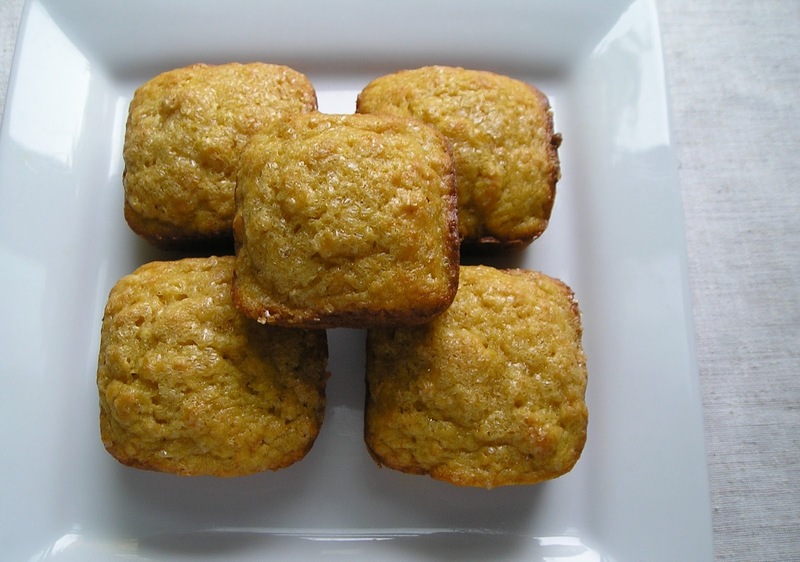 I wasn't sure if mangoes made good muffins, but a quick Google search yielded many results. A lot of them called for dicing the mango, but the recipe that caught my eye was one that called for a mango puree. I thought that sounded really interesting. It came from a blog called Holy Cow! Vegan Recipes. Here's my slight adaptation. Preheat oven to 375°. Coat a muffin tin with baking spray. In one bowl, mix the flour, salt, baking powder, baking soda, and powdered ginger. In a larger bowl, mix the oil, sugar, egg, mango puree, and vanilla extract. Mix the flour mixture into the mango mixture until all the wet ingredients are just moist. Do not overmix. The batter should be lumpy, like pancake batter, rather than smooth. Divide the batter equally among the 12 muffin tins. Top each muffin with a sprinkling of raw sugar. Bake for about 17 minutes or until a toothpick inserted in the middle of a muffin comes out almost dry, with a few crumbs sticking to it. The recipe called for 2 cups of pureed mango, and I wasn't sure I would have enough since I only had one mango. It can be quite difficult to get all of the flesh off of a mango pit. I ended up with 1¾ cups; I thought that seemed close enough! I did increase the amount of oil slightly to make up for having less liquid with the mango. It originally called for 6 tbsp, so I made it an even half cup. The original recipe also called for nutmeg, but I used ginger instead. I think ginger and mango go really well together. I used my handy-dandy square muffin tin. They are smaller than regular muffin cups, so I think I got about a dozen and a half out of this recipe. I just love the beautiful orange color. Anne from Authentic Simplicity chose to make this recipe when she was assigned my blog for the Secret Recipe Club in March 2013. Click on the button below to check out her post! I didn't post on Monday because I was busy taking my oldest daughter, Lena, to her first day of school. She is starting her second year of preschool. She looks so grown up wearing her sassy new clothes and sporting her new My Little Pony backpack. She absolutely loves school and couldn't wait to go back. I know she'll have another great year. Just made these muffins last night, this morning my family and I tried one and they were delicious! Thanks for the recipe! One thing that I did when making them was to make them smaller and make 24 of them, instead of 12. Thank you so much for taking the time to let me know how they turned out for you. Glad you and your family liked them! I made these last night and enjoyed them. I used champagne mangoes and used 3/4 cup of oat flour + 1 cup of regular flour and added 1 cup of fresh blueberries. Very yummy! Thanks! !